Since 2007, the Hong Kong health authority has implemented an anti-smoking law that bans people from smoking in all indoor areas, including work places, public places, restaurants, and karaoke lounges. This pushes office smokers to take their cigarette breaks outdoors in the street. Smokers from the same building are gradually bonded and form a new community known as "Hot Pot Pack" as they would gather around a trash bin with an ashtray, sharing small talk with raunchy jokes like they are at a hot pot dinner. 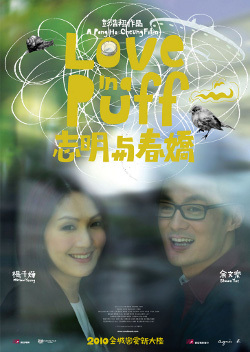 Jimmy (Shawn Yue) is a mild mannered, sneaky and smooth advertising executive in his twenties. While smoking in an alley packed with booming loudmouth co-workers and sharing explicit gossip and horror stories, he befriends a misfit cosmetics salesgirl Cherie (Miriam Yeung) who also likes to light up. And awkward romance soon blossoms amidst the anxiety of their nicotine rush. As they become more attracted to each other they also find themselves moving farther away from their regular "hot pot pack" into their own private alley, where their conversations suggest more emotional depths, covering the collision of reality and delightfully trivial matters of the bizarre people around them. 2011 (12th) San Diego Asian Film Festival - October 20 - 28, 2011 - Asia Pop!